Three Eryri Harriers completed the London Marathon on Sunday 26th April where Dyfed Whiteside-Thomas knocked 6min 44sec off his PB after passing halfway at 1:24:48, Dyfed finished in a time of 2:50:58 while Hayley Turner knocked 19m 02s off her PB to record a time of 3:53:40 with Eurwyn Edwards crossing the finishing line in a time of 4:04:39. 5 Eryri Harriers were amongst the 55 finishers in the Wrexham 10mile North Wales Championship event on Saturday 26th April where Deeside AC’s Lee Jones won the NW title in a time of 55:22 ahead of Eryri’s Brendan Rothery 57:02. 12th & 1st MV/55 Arwel Lewis 65:40. 19th & 1st MV/40 Dilwyn Rowlands 69:00. 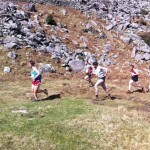 42nd & 2nd FV/35 Sioned Rowlands 80:45 a PB for Sioned and 49th Kalvin Jones 86:38. The weather conditions on the flat two lap course worsened as the race went on with the strengthening wind but at least the rain held off! Five Eryri Harriers represented the club in the final race of the 2014/15 Borders Road Running League at Wrexham on Wednesday 22nd April where, on a fast 4mile flat course, Arwel Lewis led the team home in 83rd place overall in a time of 25:21 followed by: 89th Gary Porter-Jones 25:39. 99th Dilwyn Rowlands 26:06. 220th & 2nd MV/70 Don Williams 31:06 & 252nd Kalvin Jones 33:45. There were 268 finishers. In the final team standings, Eryri’s men were placed 2nd bottom of Division 2 with 6258 points against them while Eryri’s women were placed 7th in their respectiove 2nd Division with 8180 points. In the individual standings, Don Williams was Eryri’s main winner with Gold in the MV/70 category while Arwel Lewis finished runner-up in the MV/55 category. Martin Cliffe. Alex Fletcher. Rhys James. Gary Porter-Jones. Kalvin Jones. Owen Roberts. Steffan Williams & Tony Woodall. Russell Bentley. Joanne Cliffe. Alison Donnelly. Lizzie Irvine. Lowri Jones. Gwyn Owen. Dewi Owen. Huw Owen. Matthew Roberts. Brendan Rothery. Sioned Rowlands. John Spill. Phil Targett. Huw Trainor & Ashley Wager. Highlight of the season, obviously the 6th event at Caernarfon where Eryri’s men were comfortable team winners on the day with Matt Roberts 1st ahead of Gwyn Owen & Owen Roberts 5th. Notably, Russell Bentley won the 5th event at Mold where Owen also finished 9th while John Spill finished 4th in the 2nd event at Tattenhall. 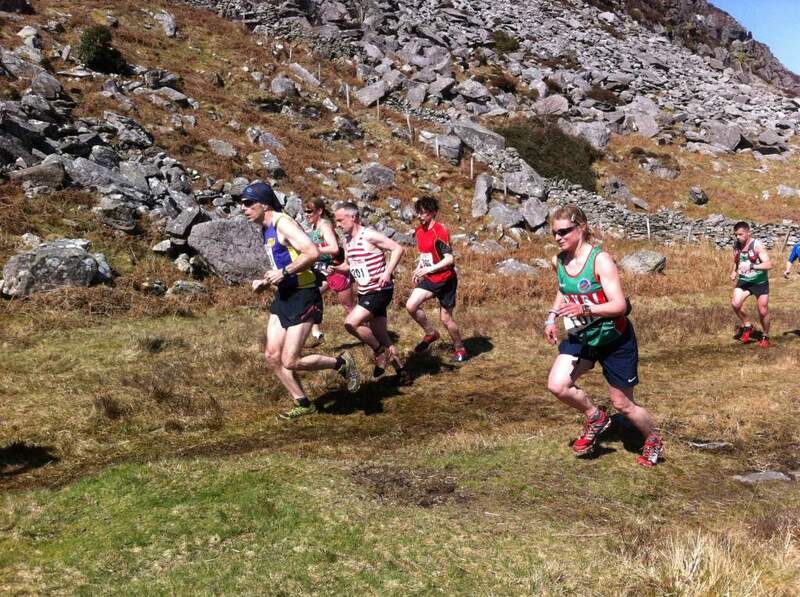 In total, Eryri have competed in 115 Border League races since they first entered the league, and their debut race at Shotton on 18th October 1998. The North Wales 10 Mile Championships takes place at Wrexham this Saturday 25th April. The event is Eryri’s fifth event in the 2015 Road Running Championships following the Wrexham H/M and the Border League races at: Prestatyn, Mold and Caernarfon. The Wrexham 10 starts and finishes at The Club House (Formerly Prysmian Club) Post Code: LL13 9RG on Wrexham’s Industrial Estate starting at 2.00pm. There will be entries on the day. 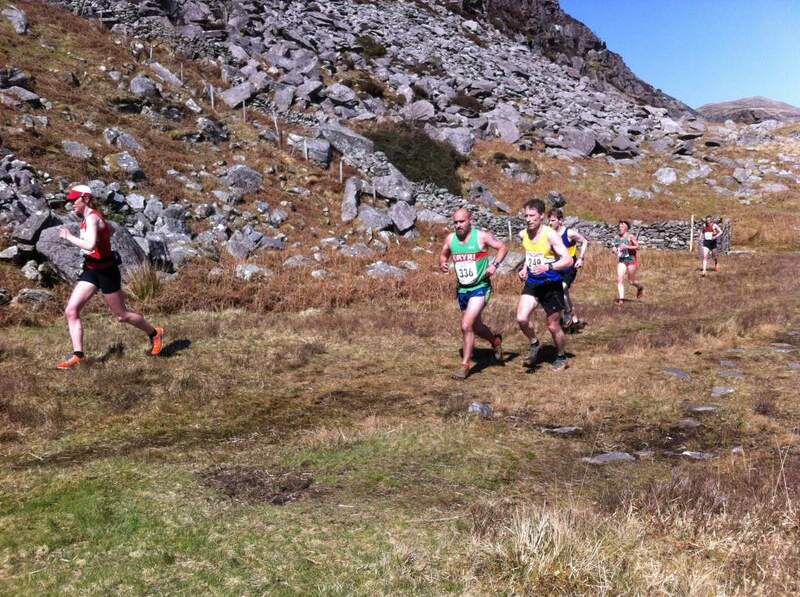 Ras y Moelwyn – 10mile fell race, held in Blaenau Ffestiniog on Saturday the 18th of May. 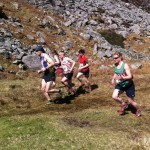 Eryri out in force for the first fell running championship race! Fantastic weather conditions and a great atmosphere including local Welsh rock bands greeted all 362 runners who pitched up for the race. This year the race started from the middle of town close to the new striking new ‘Antur Stiniog’ building. The nature of route which included exceptionally varied terrain – hard packed slate, bog, steep climbs and narrow rocky descents meant that a lot of jostling for positions occurred during this very exciting race. 1st overall male was Finlay Wild (Lochaber Athletic Club) in a time of 1:13:09 which was over three minutes ahead of second place! First Eryri club member was Richard Roberts who came in sixth in a time of 1:17:14. Male V40 went to Bob Hope (Pudsey & Bramley AC) in a time of 1:16:20, male V50 went to Mark Palmer (Mynydd Du) in a time of 1:22:32, male V60 went to Stephen Jones (Eryri Harriers) in a time of 1:32:15 & male V70 went to John Morris (Buckley RC) in a time of 2:13:36. 1st overall female was Jasmin Paris (Carnethy HRC) in a time of 1:26:54. 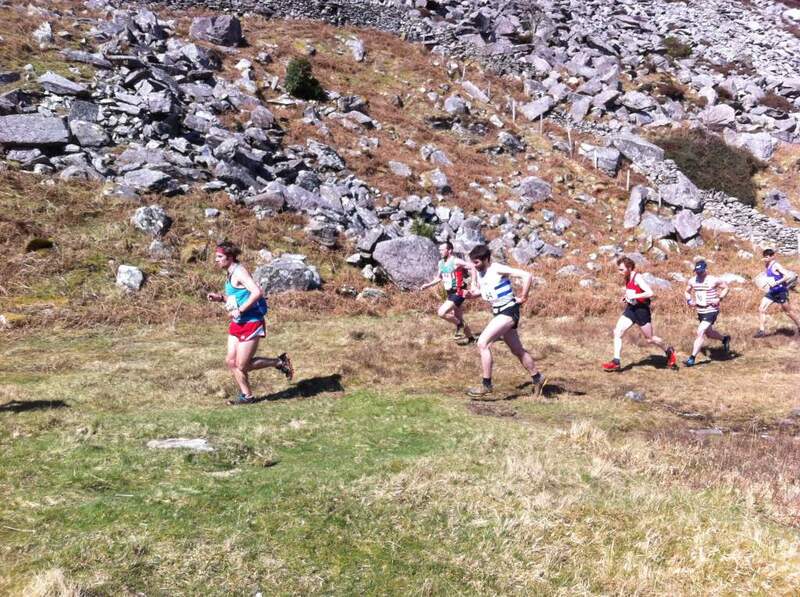 First Eryri club member was Lauren Jeska who came in third and was also first female V40 in a time of 1:30:10. Female V50 went to Elizabeth Batt (Dark Peak) in a time of 1:47:55 and female V60 went to Wendy Dodds in a time of 2:05:01. Forty seven Eryri club members attended – fantastic turnout for the club. Ras y Moelwyn – Ras mynydd 10 milltir ym Mlaenau Ffestiniog – dydd Sadwrn 18fed o Ebrill. Cyfuniad o dywydd da ac awyrgylch gwych gyda grwpiau roc Cymraeg lleol ar lwyfan yng nghanol y dref yn cyfarch y 362 o redwyr a ddaeth ynghyd ar gyfer y ras. Y flwyddyn hon yr oedd y ras yn cychwyn o ganol y dref wrth ochr adeiliad newydd trawiadol ‘Antur Stiniog’. Yr oedd natur y trywydd y gymysg a diddorol iawn gan gynnwys llwybrau caled llechi, bryniau serth a darnau cul a charegog wrth ddod yn ôl i lawr. Arweiniodd hyn at ras gyffrous iawn gyda llawer o newid safloedd yn digwydd yn ystod y ras. Y dyn cyntaf i groesi’r linell yng nghategori agored y dynion oedd Finlay Wild (Lochaber Athletic) mewn amser o 1:13:09 – dros dri munud o flaen yr ail safle! Richard Roberts oedd y cyntaf o dim Eryri a oedd yn chweched mewn amser o 1:17:14. 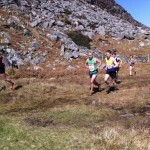 Aeth gwobr y categori V40 i Bob Hope (Pudsey & Bramley AC) mewn amser o 1:16:20, V50 i Mark Palmer (Mynydd Du) mewn amser o 1:22:32, V60 i Stephen Jones (Eryri) mewn amser o 1:32:15 a’r V70 i John Morris (Buckley RC) mewn amser o 2:13:36. Y ferch gyntaf yn y categori agored oedd Jasmin Paris (Carnethy HRC) mewn amser o 1:26:54. Lauren Jeska oedd y ferch gyntaf o dim Eryri a oedd yn drydydd ac hefyd yn gyntaf yng nghategori V40 mewn amser o 1:30:10. Aeth gwobr categori y V50 i Elizabeth Batt (Dark Peak) mewn amser o 1:47:55 a’r V60 i Wendy Dodds mewn amser o 2:05:01. Braf oedd gweld pedwar deg saith o redwyr Eryri wedi dod ynghyd ar gyfer y ras. The final race of the 2014/15 season and a chance for Eryri’s men and women to finish the off the season on a high note and improve their league positions. Directions and Race Info: Final Race and Presentation is at the Prysmian Club on the Industrial Estate at Wrexham. The course is a flat(ish) fast 4 mile loop starting and finishing at the club. Start is at 7.00. While most of us were getting blown along the Foryd in the Border League Race on Sunday 12th April, Paul Wathan was having a comfortable stroll in winning the Denbigh 10k in a time of 36:24 over two minutes ahead of the 2nd placed local athlete; John Morris (Denbigh) 38:28. The previous day, Paul won the Conwy parkrun in a new course record of 16:58 where there was another good turn out of 194 finishers amongst them: Eryri’s 4th placed Rhys Cross 18:16 and 13th Stuart McDonald 21:13.